Take a look at how calculating machines have evolved over the years. Anuli is a writer and new-media enthusiast who dreams about becoming the sixth Spice Girl. Until then follow her on Google+ or Twitter: @akaanuli. There once was a time when written numbers did not exist. Man had only his fingers and toes to use as counting devices — and counting sheep and crops using fingers, toes, rocks and shells will get you only so far. Though still in use in today, the abacus was merely the beginning of mankind’s interest in calculating machines, which have evolved radically over the years. Here we share with you a visual history of some notable calculating firsts. A Brief History: According to the History of Computers website, Wilhelm Schickard was credited with inventing the first adding machine after Dr. Franz Hammer, a biographer of Johannes Kepler, claimed that drawings of a calculating clock had been discovered in two letters written by Schickard to Johannes Kepler in 1623 and 1624. Prior to this discovery, Blaise Pascal, who developed the “Pascaline” adding machine in 1642, was regarded as the inventor of the first adding machine. Schickard’s “Calculating Clock” is composed of a multiplying device, a mechanism for recording intermediate results, and a 6-digit decimal adding device. Interesting Fact: The letters Schickard wrote Kepler were written in Latin, the international language of science and scholarship in Central and Western Europe until the 17th century. A Brief History: Hahn aspired to design a machine that would help him calculate the parameters of the clocks and planetariums he enjoyed making, according to the History of Computers website. He based his calculator on the “Stepped Reckoner” calculating machine that was developed by Gottfried Wilhelm Leibniz in 1672. Hahn’s calculator featured a set of twelve drums in a circular arrangement that could be activated by a crank located in the axis of the drums. Interesting Fact: Although the first working copy of the device was ready in 1773, the calculator was not demonstrated until 1778 because of Hahn’s difficulty with the reliability of machine’s tens-carrying mechanism. A Brief History: The arithmometer was the first commercially successful calculating machine to complete all four basic operations — addition, subtraction, multiplication and division — according to IBM. Like Hahn, Thomas also based his calculator on the stepped drum mechanism of Leibniz. The machine featured a second result display for subtraction and division as well as a multiplication gear. Interesting Fact: The production debut of the Arithmometer in 1851 launched the mechanical calculator industry. The Arithmometer was the only type of mechanical calculator commercialized from 1878 to 1887 worldwide, and was still in use up to World War I. A Brief History: The IBM 608 was the first calculating machine to use solid-state transistors instead of vacuum tubes. The machine was housed in several large cabinets. According to the company’s website, customers could purchase the machine for $83, 210 (or rent it for $1,760 a month). The machine’s main memory could store 40 nine-digit numbers and could perform 4,500 additions per second, among other operations. Interesting Fact: The IBM 608 contained more than 3,000 germanium transistors. A Brief History: In 1956, the Bell Punch Co. of Great Britain set out to diversify from manufacturing ticket punches by producing a commercial electronic desktop calculator codenamed the ANITA. According to the Vintage Calculators Web Museum, the vacuum tube–based calculator was released in 1961 under the name ANITA MK-8. The machine featured approximately 170 cold cathode vacuum tubes, a Dekatron decade counter tube and Numicator display/indicator tubes. Interesting Fact: The acronym ANITA was intended only for internal use during the development of the machine, but the name was so ingrained by the time the calculator was ready for production that the company stuck with it. The acronym has been said to stand for “A New Inspiration to Accounting” or “A New Inspiration to Arithmetic,” but rumor has it that it’s also the name of the designer’s wife. A Brief History: According to the Texas Instruments website, “Cal Tech” was the codename used for the device during its development, which was released commercially in 1970. The 45-ounce calculator featured a small keyboard with 18 keys and a visual output that displayed up to 12 decimal digits. Interesting Fact: The original 1967 prototype of the device can be found in the Smithsonian Institution’s National Museum of American History. A Brief History: The Busicom LE-120A, known as the HANDY, is the first handheld calculator to use a “calculator on a chip” integrated circuit. According to the Vintage Calculators Web Museum, the calculator featured a 12-digit display in red LED and cost $395 when it first went on sale in January 1971. Because the calculator was so expensive, it came with a wrist strap attached at its base to protect it from being dropped. Interesting Fact: According to the Vintage Calculators Web Museum, Aristotle Onassis, the Greek shipping magnate, gave the expensive calculators as gifts to friends. 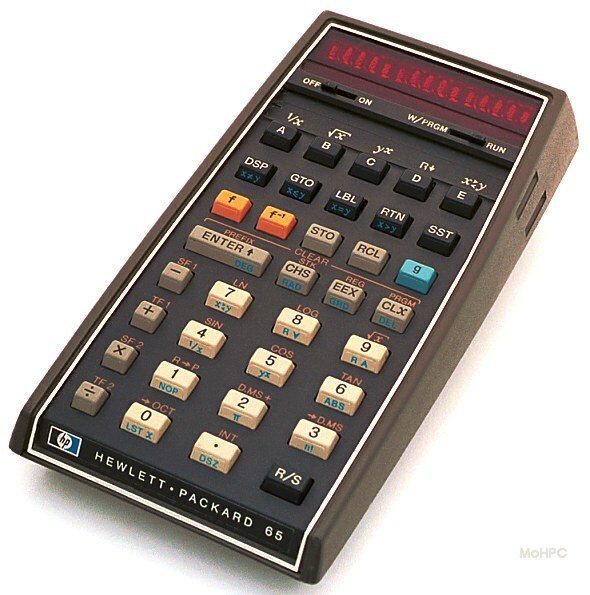 A Brief History: First introduced by Hewlett-Packard as a “Personal Computer,” the calculator allowed users to either buy programs on pre-programmed cards or write programs up to 100 lines long and record them on blank cards. The device featured user-definable keys (with 35 keys controlling more than 80 operations) and was the first HP pocket calculator with base conversions (octal and decimal). The calculator cost $795 when it launched in 1974. In 1975, during the first joint U.S.-Soviet space flight, it became the first handheld calculator in outer space. Interesting Fact: Bill Hewlett specified in the design requirements that the calculator had to fit in his shirt pocket — one reason for the machine’s tapered shape. A Brief History: The Casio fx-7000G was developed with 422 bytes of memory and could store up to ten programs in 10 program slots, according to the Computing History website. It offered 82 scientific functions, and its display could toggle between 8 lines of 16 characters each or a 64x96 dot matrix graphical display. Interesting Fact: Today’s graphing calculators like the TI-83 kept the fx-7000G’s display format. A Brief History: When most people think of touch devices, they think of using their fingers, but Sharp broke the mold by debuting the first stylus-based graphing calculator, according to Tech Powered Math. Sharp, unfortunately, didn’t find much success with the model. Interesting Fact: The EL-9650 had a slideshow functionality that allowed teachers to walk through pre-programmed lessons and formulas on the calculator. A Brief History: While the world of mobile devices quickly moved to full-color screens in the early 2000s, it took a while for graphing calculators to catch up. Casio’s PRIZM calculator, with its advanced, 216x384 resolution, full-color display, debuted in late 2010. Texas Instruments soon followed with its own color calculator, the TI-NSpire Cx, in early 2011. Students could finally bid good-bye to the monochrome, low-pixel displays of years past. Interesting Fact: The PRIZM allows students to create graphs over images, which helps them understand the real-world applications of the work they’re doing on their graphing calculators.